Switzerland's Fabian Cancellara, twice world champion in the discipline, took Olympic gold on Wednesday. The TT course was a single lap of the road race course where Cancellara took bronze on Sunday, and Cancellara rode the 47.3 kilometers in 1:02:11. 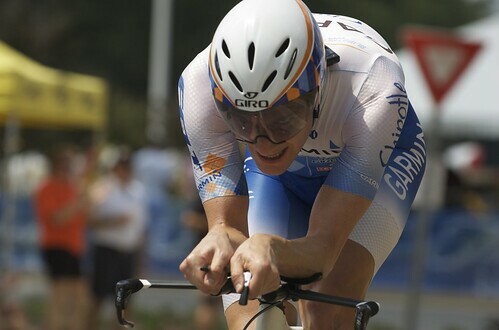 Sweden's Gustav Larsson, a teammate of Cancellara's at CSC, took silver, with American Levi Leipheimer in bronze. "I pictured myself on the top step but whether you win gold, silver or bronze, it's the Olympics. 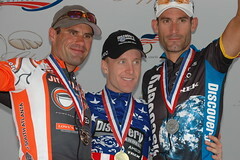 It's important," said Leipheimer. "It's a lifelong dream to get a medal at the Olympics. I fought really hard and in the end it paid off." "At training camp in America everyone had to write what they wanted to win this year. I said (the Tour of) Flanders and (Paris) Roubaix and Larsson said he wanted to be Olympic champion in the time trial!" 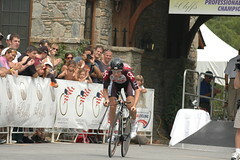 Alberto Contador took fourth, the bitterest placing at the Olympics, while Cadel Evans was fifth. On the women's side, 35-year-old American Kristin Armstrong was class of the field, overcoming an early deficit to Emma Pooley of Great Britain, who took silver. Switzerland also took a medal in the women's discipline with triathlon specialist Karin Thurig.